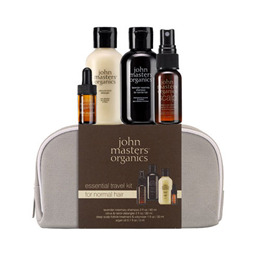 This travel kit for normal hair features lavender & rosemary shampoo, citrus & neroli detangler, deep scalp follicle treatment & volumiser and a mini argan oil. Citrus & Neroli Detangler:Aloe barbadensis (aloe vera) leaf juice*, aqua (water), behentrimonium methosulfate, cetearyl alcohol, panthenol (vitamin B5), sorbitol, simmondsia chinensis (jojoba) seed oil*, cocos nucifera (coconut) oil*, hydrolyzed soy protein, wheat amino acids, helianthus annuus (sunflower) seed oil*, lecithin, tocopherol, glycerin, citric acid, citrus grandis (grapefruit) peel oil*, citrus lemonum (lemon) peel oil*, citrus aurantium dulcis (neroli) flower oil*, canarium luzonicum (elemi) gum nonvolatiles*, cymbopogon shoenanthus (lemongrass) oil*, sodium benzoate, potassium sorbate, arnica montana (arnica) flower extract*, camellia sinensis (white tea) leaf extract*, chamomilla recutica (chamomile) flower extract*, calendula officinalis (calendula) flower extract*, equisetum hiemale (horsetail) leaf/stem extract*, foeniculum vulgare (fennel) seed extract*, lonicera caprifolium (honeysuckle) flower extract, linum usitatissimum (flax) seed oil*, borago officinalis (borage) seed oil*, sodium hyaluronate (hyaluronic acid), sulfur, limonene, citral, linalool. * Certified Organic. Scalp - Deep Scalp Follicle Treatment:Aqua (water), glycerin, sorbitol, panthenol (vitamin B), centillica asiatica (gotu kola) extract,* chondrus crispus (irish moss) extract,* plantago asiatica (chegian zi) extract,* arctium lappa (burdock root) extract,* hydrolyzed wheat protein, urticia dioica (nettle) extract,* yucca schidigera (yucca) extract,* hamamelis virginiana (witch hazel) distillate, arnica montana (arnica) extract,* anthemis nobilis (chamomile) extract,* hyaluronic acid, camellia sinensis (white tea) extract,* lavandula angustifolia (lavender) extract,* calendula officinalis (calendula) extract,* tocopherol acetate (vitamin E), carica papaya (papaya) extract, cucumis sativa (cucumber) extract,* soy protein, sodium benzoate, potassium sorbate, simmondsia chinensis (jojoba) oil,* triticum vulgare (wheat germ) oil,* thymus vulgaris (thyme) oil,* linum usitatissimum (flax seed) oil,* rosmarinus officinalus (rosemary) oil*. * Certified Organic. 100% Argan Oil:Argania spinosa (argan) oil* (100% certified organic argan oil). Lavender & Rosemary Shampoo:Wet hair, lather and rinse. Citrus & Neroli Detangler:Apply to wet, clean hair. Leave in for 1-3 minutes. Rinse well (or leave in). Follow with styling product if desired. 100% Argan Oil:Simply apply a few drops to hair or skin and massage into area. Below are reviews of Essential Travel Kit for Normal Hair by bodykind customers. If you have tried this product we'd love to hear what you think so please leave a review.